Thanks to Cornerstone VNA, and some very special people, I am writing to you today to share my story. Last summer I was diagnosed with Chronic Obstructive Pulmonary Disease (COPD) and Congestive Heart Failure (CHF). When I got home from the hospital, I was weak, exhausted, and short of breath, even when speaking. I was anxious and down in the dumps about how this was affecting my life. It was a scary time, but the nurses at Cornerstone VNA were there to help me every step of the way. 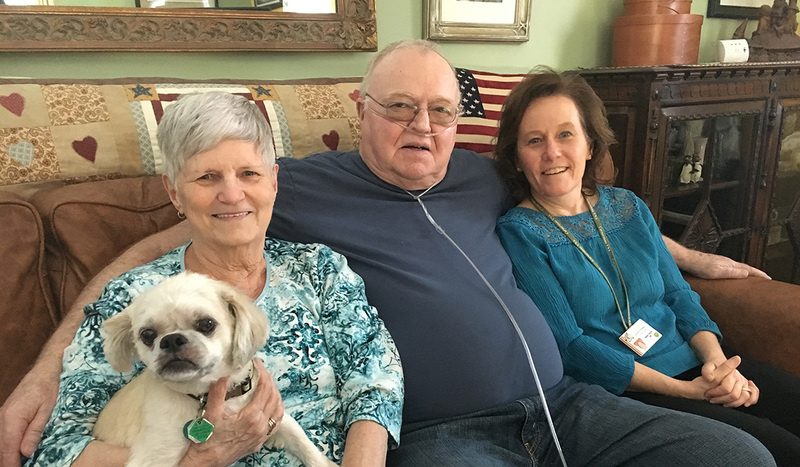 Once my health began to improve, my Palliative Care nurse, Mitch Maihiot, RN, thought I should try Telehealth so that I could continue to get better. Mitch taught me how to use the Telehealth device, which had educational videos, information about my diseases, and the ability to video call a nurse at Cornerstone VNA. My Telehealth nurse, Anne Carle, RN, monitored my vitals from her office computer and video called me if she was worried about me. In a flash she would schedule a nursing visit or alert my doctor if needed. Thanks to Anne and Telehealth, I could talk again without feeling short of breath and I was becoming more active. During my 4 months with Cornerstone VNA, I had only one ER visit and was never admitted to the hospital. Telehealth saved my life and has given me more quality time with my wife, Nona, and my dog, Pepper. I find that Telehealth makes me feel more secure that I am doing the right thing. My anxiety is less and it helps to know there is someone there to help if I need it. It makes my life a lot better, I am able to cope better, and it keeps me on the right track. The education videos are very good and have helped me manage my symptoms. I have a better outlook on life and I am more satisfied with ‘what I can do’ rather than ‘what I can’t do’. Being a chronic patient, I am very grateful for this service.